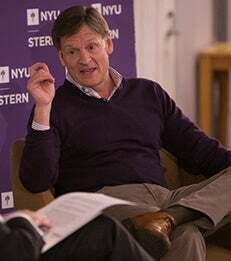 On December 8, NYU Stern hosted the second installment of the "In Conversation with Mervyn King" series featuring Michael Lewis, best-selling author of Liar's Poker, Moneyball, The Blind Side and Flash Boys, on his new book The Undoing Project: A Friendship that Changed Our Minds. Lord King, former Governor of the Bank of England, Baron King of Lothbury, Alan Greenspan Professor of Economics and Professor of Economics and Law at NYU, moderated the one-on-one interview, followed by an open Q&A session. Lord King wrapped up the conversation with a reflection on the broad impact of Lewis’ work before turning the floor over to the audience for questions.